Despite all our fears and the warnings from everyone with experience of panel decisions, the pre-panel meeting led to a decision in our favour. We knew that we had a really strong case, but had prepared ourself for the worst. The panel agreed that although there may be some concerns from our past, they needed much more information to make a decision. It's a while since I've written on my blog, and even longer since I wrote to you (well, apart from the postcards from when I go away). Partly that's because I haven't really got into the habit of writing blog posts regularly so its been easy to let other things get in the way, but is mainly because of the problems that we have been having with the adoption process. Just over a month ago, our social worker and her team leader meet with your Mum and I. They are worried that the bad experiences you Mum has had in her past will mean she will struggle to cope with looking after you, especially if you are misbehaving, or trying to deal with bad things that have happened to you. At first they tried to persuade us to give up our application to become your parents saying that the panel that make the decision wouldn't approve us, then they tried saying that even if we didn't get approved, your social worker (and other children's workers) would look at our report and say that we wouldn't be able to look after you. Then they tried to fob us off with waiting, but with no idea of what would have to happen to end that wait. Finally they have offered us the chance to go to a pre-panel meeting to get their advice on what they should do about our application. Basically the social worker has looked at a time in your Mum's life when things were very difficult and assumed that she will be the same in the future. She has ignored what your Mum has been like since then, ignored what various professionals that know your Mum have had to say about her and not spoken to anyone who can tell them about me. From what we can see the social worker's view are not based on any real evidence and we are hopeful that the panel will see that and rule in our favour. If not, there is an independent body that can review the situation and they should be able to see the truth of the situation. I've ranted about the unfairness of the situation with friends, planned the best way to prove to the social workers what sort of people your Mum and I are with colleagues, but with you I want to take a different tack - to try and show you what lessons you can learn from this. 1. Don't give up when things get tough - Sometimes life deals you a bad hand, sometimes it seems that the deck is stacked against you. Unfortunately in situations like that all you can do is keep on, keep trying your best and know that things will get better. I'm know there will have been times when you frustrated your Mum and I - being a parent is one of the toughest jobs there is and if you haven't stormed out of a room telling us 'I hate you, your ruining my life' at least once by the time you are 18 then we probably aren't doing our job! No matter how hard it gets though, your Mum and I will have kept on parenting you. When I'm out walking I can't give up just because the weather has got suddenly worse - I need to keep going till I get to somewhere with shelter. When one of your Mum's patients doesn't want to eat, she can't let them starve - she needs to find ways to persuade them to take the food. I hope you can look at the things your Mum and I do in our lives and see that having determination to keep going is one of the most important things you need in life. Giving up means that you don't get what you want or need, that you lose out. 'If you are going through hell, keep going' as Winston Churchill once said. 2. Authority isn't always right. When it is, accept it, when it isn't challenge it. - As a teacher it's sometime very hard to get this message across to young people. When authority figures stop you from doing something, it can be very hard to step back and look at the situation from an unbiased point of view. Often they are right - there are good reasons why I don't let pupils eat in a science lab, or make them do homework. If those reasons aren't clear to you, ask. Ask politely, ask appropriately, but ask them to justify the reasons. If those reasons are valid, accept them. You may well feel angry, you may well feel your pride is hurt but those feelings will pass in time and you can move on. If the reasons aren't valid though, then challenge the system. Challenge them appropriately; shouting, swearing, threats they just make people dig their heels in and fight back and in most cases that makes the situation worse. Challenge the right person; sometimes it is one person that has made a mistake. The chances are they haven't done it deliberately, but have made the wrong decision based on the information they have. Help them see why they have made the wrong decision, give them the information they need, explain to them what it means. Sometimes it won't be the person that is wrong, but the system. In that case, challenge the system not the person - many people think that the benefit of living in a democracy is that we can vote on who rules us. It isn't - the benefit is that we have a system that has built-in methods that allow you to make changes to it so that it works effectively. As a citizen in a democracy it is both your right and responsibility to use though methods when appropriate. 3. We are on your side. I know the social workers think they are making a decision that is best for you. We know they are are wrong and so we are working to help them see that. By the time you read this, your Mum and I will have fought hard to be your parents, we will have fought hard to giving you the right kind of parenting. Sometimes that will have been hard for us, sometimes it will have been hard for you. Despite what a TV advert currently claims it is better to be a parent than a friend. I'm sure there will have been times when you wondered why we made you do things you didn't want to, or wouldn't let you do things you wanted to. Hopefully bu now you are old enough to understand our reasons and to see that we did what we did to give you a safe, secure, loving and happy childhood so that you could grow up to be the best possible person you can. We are fighting hard now to be your parents, we will work hard to be the best possible parents to you. No matter how hard it gets, you are our number one priority and we will always do everything in our power to ensure that you get what you need. Other people may have let you down in your life - I can promise you that your Mum and I never will. Wednesday was the second day of our training course. In the morning we had a session on attachment and some of the issues that poor attachment can cause. It was quite eye - opening and a bit daunting if I'm completely honest. The second season was about the stages in the adoption process. It was good to hear the views and thoughts of the adoptive parents who had been through it all, but I have to admit I'm not sure it was the best use other training time. I think most people on the course had a pretty good idea of all the stages. The afternoon was spent talking to adopters and hearing their stories. This was definitely the most useful part of the session, although again quite a bit of time was spent talking about the process and the delays and problems they had. I know the LA must be limited in which adopters are able to help on the course, but I did think it would be useful to hear from people who have had adopted children for 10 years or so. The adoption process is obviously important, emotional and stressful but it is only for a limited time. Once it is done we will be adoptive parents for life and I think it would be useful to spend some time thinking about longer term issues. Overall though, the course was informative and thought provoking. I'm looking forward to the last 2 days next week. 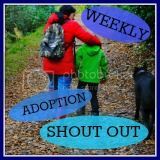 Edit: I'm adding my regular link to the Weekly Adoption Shoutout. The theme for this week is contact - not something I can really comment on at this stage in our journey, but there are some intersting blogs linked to it. That aside it was a good day - its nice to meet and chat with people in the same way situation a day to share stories of the journey so far and useful, though shocking, to read some of the children's backgrounds. It seems strange writing this post, given that it's only a few weeks ago I was complaining about how slowly the process was going. Patchwork had a meeting with our SW this week and she mentioned that she would like to try and get us to panel by the middle of June! I have one week over the Easter break when we are in the country - during that week our SW wants to do an interview with both of us and 2 more interviews with just me. I must admit I've got slightly mixed feelings about this. On one hand it's great that she wants to move things on quickly, especially as we had so many delays to start with. On the other hand though, I am slightly worried that it may be taking things too quickly and that we will both need time to process all of the information we get from the training and preparation discussions. I'm sure our SW won't move us on faster than we can deal with but it does seem a bit odd to be thinking about a possible panel date before we have even started the training course. I spent a lot of time over the half term break sorting paperwork for the LA. They've asked us to provide 6 non-family members each to act as referees, but want people who have known us over various stages in our lives and in different capacities - not an easy task, but I think we have both managed it. I know its a chronometer, but there aren't any good images for chronologies! We've had to produce chronologies of all the key events that have happened in our lives since birth, including schools, addresses, key relationship events, employment etc. It took a while to collect all the information together but even if now I have sent it off, new minor things keep popping into my mind that I missed off. I thought the wonderful thing about Tigger was that he was the only one. 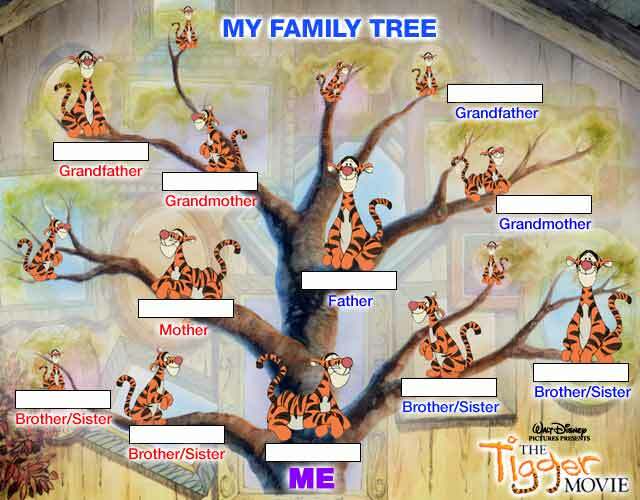 We've also had to produce family trees for our immediate relations. These are complicated enough to start with, but when you start having to include ex - partners of current partners of step-siblings it gets a bit silly. They need to be in there though as they are parents of children we have contact with. The final tree is too large to print out, even on A3 paper, so i'm going to have to do some reformatting of it at some point! On a side note, producing the close family tree has inspired me to do some more research on the family tree that my dad started a few years ago. With the help of Ancestry.co.uk I've tracked my paternal line back to 1780 - I think that's a bit more detail than the SW needs though! All of this paperwork formed the starting point for my first preparation interview with our SW, which took place last Friday. Although the SW was supportive throughout the interview, I found it quite grueling from an emotional point of view. The purpose of the meeting was to look into how my life experiences might help me cope with the demands of parenting an adopted child and help guide them through the difficulties they are likely to face. For understandable reasons a lot of the time was spent talking about some of the more difficult aspects of my life - being bullied, divorce as well reflections of my time spent working in the institutes in Romania. It was a very intense hour and half to say the least, but generally very positive. For any readers who are reading this blog for hints and advice, the main hint I would give is to give yourself time after the interview before having to do anything significant. My interview took place at work (it was more convenient for me and the SW) but I was glad that I had a lunch break to collect my thoughts - I don't think I could have walked straight from the meeting into the classroom. I thought I'd try something a bit different for this blog post - an open letter to our adoptive child. If I'm organised enough to keep this safe and accessible somewhere, I'm hoping that at some point in the future we can sit down and read this (and other future letters) together as we explore our life stories. 24 hours after hearing the news from the LA that they will train us as prospective adoptive parents (PAPs) and I'm still catching myself smiling happily just because the journey has finally started. The reality is finally starting to sink in a bit though, in a way that it hadn't before yesterday. Reality 1 - I'm going to be a Dad. It's something I've always wanted and over the last few months its something I've had to start working hard towards but suddenly it seems daunting. its no longer just a vague 'I'm going to be a Dad at some point' to 'I'm going to be a Dad at some point in the near future'. All the thoughts that my male friends are telling me are starting to surface , "Am I going to be able to cook food you'll want to eat? ", "Will I master the art of putting clothing on a wriggling child?" "Will we have a good relationship? ", "How much will you moan when I try to get you to come walking with me? ", "Are you going to want to watch cricket matches with me without saying 'Dad, can we go yet? I'm bored' all day? ", "How am I going to pay for all the things you need and some of the things you want? ", "Will you understand that there is a difference between those two categories? ", "Will I be a good role model?" - basically "Will I cope?". In my heart I'm sure I will, but that doesn't stop the doubts. Reality 2 - I'm going to be a Dad at some point in the near future - that sentence has a vagueness than birth parents don't really have to face. If things go quickly and smoothly, you could be with us in 6 months time. Alternatively, I could still be wondering when you are going to turn up in a years time. I got an email from the local theatre advertising the Christmas panto - I was thinking of taking K. and L. but I don't know if you'll need a ticket or not yet. There's even an outside chance you might be here to watch Hampshire win the t20 championship for the 3rd time in 4 years! Reality 3 - The chances are you are already out there somewhere, maybe with your birth family, maybe with foster carers or some other situation. I don't know what you are going through right now but I hope that you are safe and looked after, that someone is taking care of you properly. I hope for all that, but I know that the reality could well be different. At best you are probably with foster carers, well-fed, properly clothed, a warm bed, toys to play with, getting the medical care you need and the attention you deserve. At worst....at worst the odds are that you weren't getting all of that. I know that bad things happen to people who don't deserve it, for all sorts of reasons. Hearing stories about neglect, abuse and all the other horrific things that are out there is hard enough when it happens to a stranger. You aren't a stranger, you are my child. And to make things worse, there's nothing I can do to protect you right now. That makes me angry and furious in a way that I've never felt before. It sounds silly - getting angry and furious over something that may not even be happening, feeling it is personal when I know nothing about who you are yet. It certainly sounds irrational, but then when has parental love and concern ever been rational? Reality 4 - At this stage your mum and I know nothing about you - What's your name? Are you male or female? How old are you? What colour are your eyes and hair? What's your favourite colour/toy/food? and a thousand other similar questions. Every prospective parent is just as ignorant at the start, but I find it a bit bizarre to think that there are people out there who do know these things. It seems wrong to end a letter with 'I love you' when you don't know the first thing about the recipient, but it seems just as wrong to write a letter to my child and not say it. How about this as a compromise?